You may choose to not refresh Catacombs de Paris during your refresh phase. 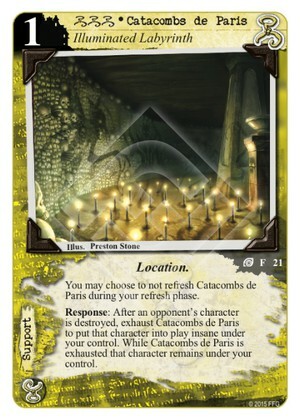 Response: After an opponent’s character is destroyed, exhaust Catacombs de Paris to put that character into play insane under your control. While Catacombs de Paris is exhausted that character remains under your control. Finally a new way to steal characters ! Yes ! Hastur is not famous for its aptness at destroying strong characters - but if you can pull it off, no other restrictions to make it yours permanently. If the character i want to steal has Terror icons and cannot go Insane, how is this handled? This is a response to destruction, so the destruction effect has resolved and the target card is notionally in the discard pile. We know from other cards (eg Dikes of Ys) that things that can't go insane, can still enter play insane. Since the card you are taking over is entering play rather than just switching control, it matches well with the Dikes of Ys behavior and thus we know that it can enter play in the insane state, regardless of (T)/willpower. If they destroy catacombs, or it gets refreshed, does the character return to their control, in play? Yes it stays in play. There are a couple of control-while-attached cards, and I believe this resembles that, and that on their removal the character's implicitly returns to the owner's control (which will usually, but not necessarily, be your opponent's).